Schools in Calderdale are celebrating being top of the class as the borough ranks above the national average in the recent secondary school league tables, published by the Department for Education. 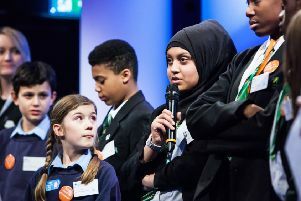 The two tables see schools ranked on Progress 8, a measure which looks at how much improvement is made by pupils at the school, and Attainment 8, which looks at the raw attainment from pupils in their best eight subjects, including English and maths, during key stage four (GCSEs). 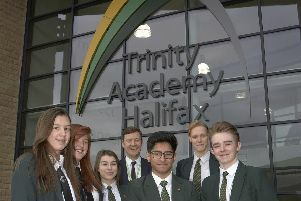 Trinity Academy, Halifax came top of Calderdale’s Progress 8 table with 0.59 which is well above the national average of -0.02. This is the third year that schools have been scored using this measure which looks at the improvement of pupils at the school. Trinity Academy Sowerby Bridge, which is looked after by the Trinity Multi Academy Trust, also placed second on the Progress 8 table. Trinity Academy Sowerby Bridge (which was placed into special measures by Ofsted in October 2016), joined the Academy Trust in early 2017. In 18 months, the school has improved its ranking from second to bottom in the local authority to second from the top. The Crossley Heath School, Halifax topped the Attainment 8 table with 73.5, ranking high above the national average of 46.5. This is the second year schools are ranked on their Attainment 8 score and it is based on how well pupils have performed in up to eight qualifications, which include English, maths, three English Baccalaureate qualifications including sciences, computer science, history, geography and languages, and three other additional approved qualifications. Head teacher of Crossley Heath, Lynnette Cassidy, said: “We are extremely pleased with this excellent set of results. “Despite the significant challenge posed by the major changes to the GCSE, staff and students have responded positively and have achieved some amazing results. Calder High School, Mytholmroyd was the top performing school in the upper Calder Valley, placing third for Attainment 8 in Calderdale with a score of 51.8. Head teacher Tony Guise, said: "We are really pleased. This is the third year running we are one of the top performing schools in Calderdale. "We don't do what we do for the league tables, we do it so the students get the best grades possible. "The great results are down to the hard work of parents, students and staff,"
Hipperholme Grammar School was the top performing school in the Brighouse area, placing fifth in Calderdale for Attainment 8 with a score of 50.2. Head teacher of Hipperholme Grammar School, Jackie Griffiths, said: “We placed fifth in Calderdale and we are delighted with that. “This year’s intake had some students that were a challenge but they achieved way beyond expectations.